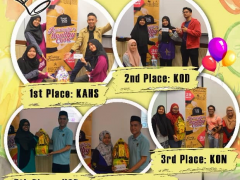 We would like to congratulate the winners for Healthy Cooking Competition, which is the sub-event of 'Ratatouille's Healthy Cooking 2018' organized by Allied Health Sciences Student Society (HEALS) on last Sunday 30/9/2018. We also would like to acknowledge contributions from our speakers; Assoc Prof. Dr Nik Mazlan Mamat and Asst. Prof. Dr Wan Azdie Mohd Abu Bakar for sharing their knowledge and cooking skill. Our appreciation goes to Asst. Prof. Dr Nor Azwani Mohd Shukri for her guidance and support as Programme Advisor, and special dedication to all members of Department of Nutrition Science, Kulliyyah of Allied Health Sciences for facilities and moral support.